Helen Rose Shine kneels in prayer during a Mass for National Catholic Youth Conference pilgrims Oct. 29. A participant in the Oct. 29 Mass wears a shirt in support of the upcoming trip to Indianapolis for the National Catholic Youth Conference. GATES — TSWAG — Two Saints With A Ghost. Building God’s Church — St. Pius Strong. GLOW — Go Light Our World — St. Patrick, Victor. These were just some of the phrases on the brightly colored T-shirts and sweatshirts worn by the youths who packed St. Jude the Apostle Church in Gates Oct. 29 for the National Catholic Youth Conference Pilgrim-Parent Gathering and Mass with Bishop Salvatore R. Matano. The more than 400 high-school students from the Diocese of Rochester will be wearing these shirts when they represent the diocese and their parishes at the National Catholic Youth Conference (NCYC) in Indianapolis Nov. 16-18. The biannial, three-day conference features keynote Catholic speakers, prayer, workshops, Mass, concerts and exhibits aims to help teens grow in their faith as well as gives them the opportunity to connect with more than 25,000 of their peers from across the country. 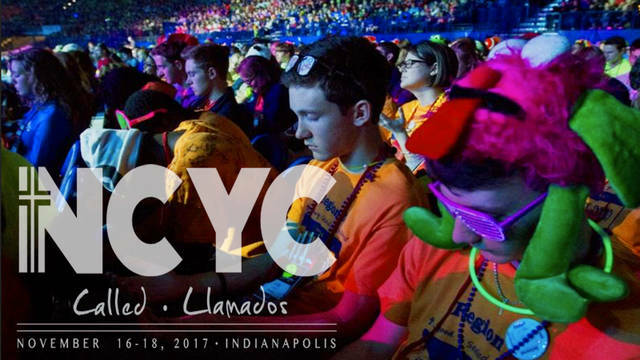 The gathering, which was designed to preview what the youths would experience at NCYC, began with a Mass celebrated by Bishop Matano. While the items of clothing the teens wore weren’t the focus of the day, Bishop Matano referenced fashion in his homily. He told the teens that their faith has risen above all different trends, fashions and styles, joking that they weren’t familiar with the bell-bottom pants or leisure suit fashion trends of the 1960s that have come and gone. “Fashions change, fashions come and go, trends come and go, the only thing that remains permanent is our Catholic faith, that is what gives us direction and moral compass,” Bishop Matano told the teens. At the end of his homily, he wished the young people a positive and holy pilgrimage to NCYC. “My dear young people, don’t postpone for a moment coming close to Jesus and making him the guide for your entire lives,” he advised. After Mass the youths participated in interactive games and activities similar to the ones they will find at the Thematic Village in Indianapolis, such as making rosaries and a game of trivia with Fathers Matthew Jones and Peter Van Lieshout. They also signed their names to a banner that will be taken to the conference. Rachel Potter and Kristina Decosse will both be attending the conference for the first time. They decided to participate after hearing about their older brothers’ NCYC experiences in 2015. “My brother said it was life-changing to see how many people share the same faith,” said Kristina, a member of the Parish of the Holy Family in Gates. “I want to experience what my brother and my dad (who served as a chaperone) experienced,” added, Rachel, whose mother and father, Laurie and Michael, will both serve as chaperones this year. Rachel also will have a special role at the conference as a youth ambassador. In that role, she will lead the opening prayer before one of the workshops and also will introduce its presenter. Although she is looking forward to the opportunity to be more involved during the conference, Rachel also is excited about sharing the experience with her youth group at Parish of the Holy Family. “We are close in our youth group, and I’m looking forward to getting to experience this with each other,” she said. 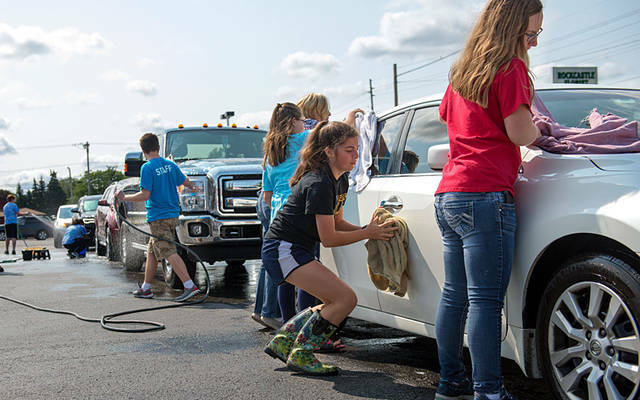 EDITOR’S NOTE : Catholic Courier New Media Coordinator Gina Capellazzi and Staff Photographer Jeff Witherow will be traveling to Indianapolis for the National Catholic Youth Conference with pilgrims from the Diocese of Rochester. Look for their live updates, photos and videos on the Courier’s Facebook page (www.facebook.com/CatholicCourier) and www.CatholicCourier.com, along with the stories on different aspects on the conference and the local youths who are attending.